What famous & great people said about Prophet Mohammed (SAW)? Here are some of the best quotes by non-Muslim scholars. (1783-1859) Well-known as the “first American man of letters”. He was sober and abstemious in his diet, and a rigorous observer of fasts. He indulged in no magnificence of apparel, the ostentation of a petty mind; neither was his simplicity in dress affected, but the result of a real disregard to distinction from so trivial a source … In his private dealings he was just. He treated friends and strangers, the rich and poor, the powerful and the weak, with equity, and was beloved by the common people for the affability with which he received them, and listened to their complaints … His military triumphs awakened no pride nor vain glory, as they would have done had they been effected for selfish purposes. In the time of his greatest power he maintained the same simplicity of manners and appearance as in the days of his adversity. So far from affecting regal state, he was displeased if, on entering a room, any unusual testimonial of respect were shown to him. His (i.e., Muhammad’s) memory was capacious and retentive, his wit easy and social, his imagination sublime, his judgment clear, rapid and decisive. He possessed the courage of both thought and action. My choice of Muhammad to lead the list of the world’s most influential persons may surprise some readers and may be questioned by others, but he was the only man in history who was supremely successful on both the religious and secular level. Professor (Emeritus) of Arabic and Islamic Studies at the University of Edinburgh. His readiness to undergo persecutions for his beliefs, the high moral character of the men who believed in him and looked up to him as leader, and the greatness of his ultimate achievement – all argue his fundamental integrity. To suppose Muhammad an impostor raises more problems than it solves. Moreover, none of the great figures of history is so poorly appreciated in the West as Muhammad. He was Caesar and Pope in one; but he was Pope without the Pope’s pretensions, and Caesar without the legions of Caesar. Without a standing army, without a bodyguard, without a palace, without a fixed revenue, if ever any man had the right to say that he ruled by a right Divine, it was Mohammed; for he had all the power without its instruments and without its supports. I became more than ever convinced that it was not the sword that won a place for Islam in those days in the scheme of life. It was the rigid simplicity, the utter self-effacement of the prophet, the scrupulous regard for his pledges, his intense devotion to his friends and followers, his intrepidity, his fearlessness, his absolute trust in God and in his own mission. These, and not the sword carried everything before them and surmounted every trouble. 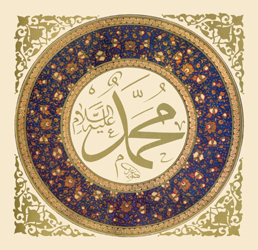 The greatest success of Mohammad’s life was effected by sheer moral force without the stroke of a sword. Four years after the death of Justinian, A.D. 569, was born at Mecca, in Arabia the man who, of all men exercised the greatest influence upon the human race . . . Mohammed. Serious or trivial, his daily behaviour has instituted a canon which millions observe this day with conscious mimicry. No one regarded by any section of the human race as Perfect Man has been imitated so minutely. The conduct of the Founder of Christianity has not so governed the ordinary life of His followers. Moreover, no Founder of a religion has been left on so solitary an eminence as the Muslim Apostle. Previous: Good luck Bad luck Who knows?